Doing business means getting reviews – there’s no way around it. And the more success you attain the more public and precious your image becomes. Therefore protecting your online brand is a must for thriving in this super-connected world in which we find ourselves. Here are some steps to take for responding to, and even preventing a public relations crisis. Setting up Google Alerts for the appearance of your company’s name is easy and free. 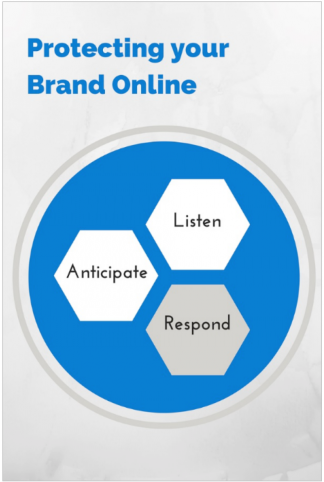 If you’re brand is already a topic of chatter online you may need to add a more comprehensive tool like Mention.com. It’s a paid service but provides real-time alerts so you can respond to all mentions, positive and negative, right away. Today’s consumers value transparency. If your company screwed up and someone calls you out on it, the worst thing to do is try and deny the mistake, blow if off, or shift the blame to “the supplier” or some other boogeyman. Those reactions only tend to multiply the negative press. Instead, explain how you value this opportunity to improve your service/product and turn the situation into a positive PR moment. That bad review just became a stage for displaying your awesome customer service philosophy. That’s how great brands are built! Just wanted to use some alliteration there, but the truth is that proactively telling the web about your positive stories is the best way to lessen or even avoid future attacks. You need to be concerned not only with online review sites like Yelp, but also Google’s organic search results and your social media brand mentions. - Social profiles – it’s common to see LinkedIn, Facebook, Twitter, and other social media channels on Page 1 of Google, so control what people see by optimizing your company pages. This has the dual effect of proactively managing your image on social media as well. - SlideShare – this presentation platform is good for lead generation as well as telling your company story visually. What proactive measures does your business take to make sure your positive stories are told?